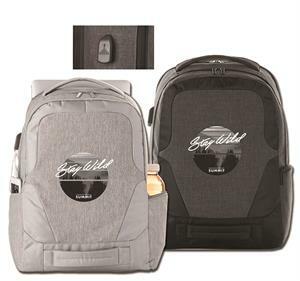 Make traveling easier with the Overland 17” TSA Computer Backpack. TSA computer compartment that holds up to a 17” laptop and lays flat to go through security. USB port and cable which are included allowing you to charge your devices inside your bag with a power bank for seamless charging. Top and front grab handle, side zippered pockets. Beautiful graphite color ways with padded back and shoulder straps. 600D PolyCanvas. Your logo is silkscreened on the front pocket. Other imprint options are available, call for details. For logos: Add a set-up charge of $55.00 per color on new orders; $25.00 on re-orders. For Full-Color Imprint (Photograffix): Add one $95.00 set-up charge plus full-color charge based on qty ordered. 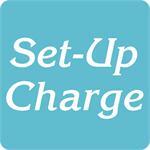 For orders that require a set-up charge of $95.00.